This event takes place to mark the conclusion of Chapter Two of Net Art Anthology, an online exhibition that retells the history of net art through one hundred artworks, released one per week over the course of two years. Chapter Two featured works from the years 1999–2004. 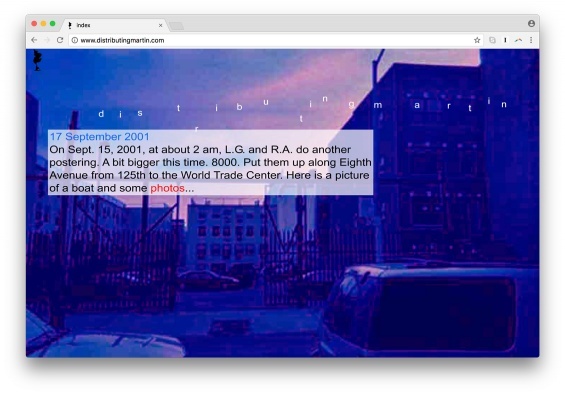 The 9/11 attacks were a pivotal moment in the internet’s role in public life in the US, one of the first times that a national tragedy would be consumed and processed online at such a massive scale. Although the first images of the collapsing towers were screened on live television, intense public discussion quickly moved to the internet, where users began to process grief, seek out news and rumor, swap jokes and propaganda, and plan protests. At the same time, the internet was promptly identified as a potential terrorist threat, and legislation was ushered in to vastly expand state surveillance. In this context, a number of contemporary artists began to grapple with the ways in which content had begun to acquire meaning and power through its circulation in this emerging network, even as it was subject to endless duplication, deterioration, and manipulation. They sought ways to intervene in this complex ensemble, harnessing its capacity to produce and propagate meaning and exploring its blind spots and limitations. This presentation and discussion convenes artists and scholars to revisit the network culture that emerged in the post-9/11 moment and its relevance for artists. Following a screening of Seth Price’s Rejected Or Unused Clips, Arranged in Order of Importance (2003), David Joselit will discuss Price’s approach to image circulation as he articulated it in his seminal work Dispersion (2002–ongoing). Rhizome’s Assistant Curator of Net Art Aria Dean will present William Pope.L’s work Distributing Martin (2000–2005), a conceptual gesture that aimed to distribute “Martin Luther King Jr.”—as a name, as an idea, and even as genetic code—through as many channels as possible, both analog and digital: flyers, billboards, postcards, a blog-like website. Mariam Ghani will present How to See the Disappeared: A warm database (a 2004 collaboration with Chitra Ganesh), a project that gathers and visualizes the stories of those rendered politically invisible to the network. Finally, Eva and Franco Mattes, aka 0100101110101101.org, will explain what they learned by putting their lives—or at least, the entire contents of their desktop computer—into circulation as an artistic act for the online performance work Life Sharing (2000–2003). Together, these works reflect a moment in which artists were beginning to reckon with the internet as a pervasive social and cultural force, setting up lines of inquiry that remain equally urgent in the present. Net Art Anthology is generously supported by the Carl & Marilynn Thoma Art Foundation. Rhizome’s public programs are supported by the New York City Department of Cultural Affairs and the New York State Council on the Arts with the support of Governor Andrew M. Cuomo and the New York State Legislature.